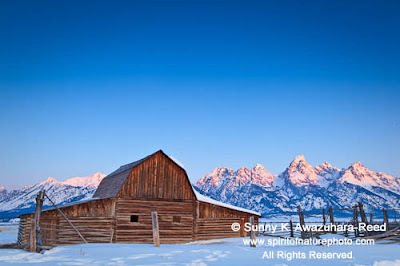 This old barn and the rugged Teton Peaks are well known photo locations in Grand Teton National Park. You may have seen this iconic scenery in a poster or postcard before. 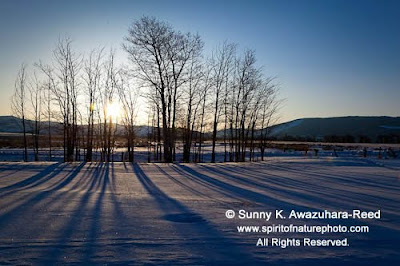 I always wanted to photograph this scenic view at sunrise, especially during a winter in snow. Normally, snow in the area is very deep, at least several feet, and the road is closed. 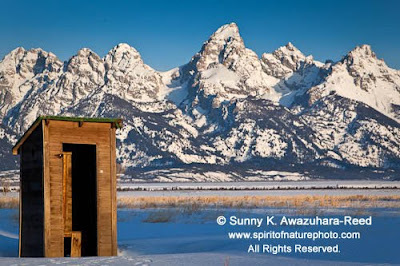 However, this winter is mild in the Grand Teton area, 40 percent less snow fall than average winters. Snow is melting fast in March; the road is open earlier this year but still enough snow for “winter scene” images. One morning in mid March, I was setting my camera before sunrise. I was hoping for a beautiful alpenglow on the Teton Peaks. The sky was clear, around 7:30 (thanks for the spring time forward), the east horizon was becoming slight orange and the whole area turned to pale blue. Then, the tips of the Tetons lit up magenta. The light was gradually shifted to lower peaks and the mountains were colored salmon pink! The alpenglow was fading in a few minutes, and warm light enveloped the whole area. I was moving up to other historic buildings and took some shots. 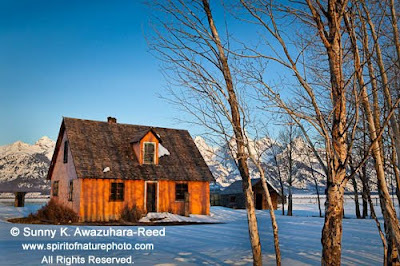 This historic homestead, called “Mormon Row,” was originally built in 1910s by early settlers. I liked this historic outhouse! 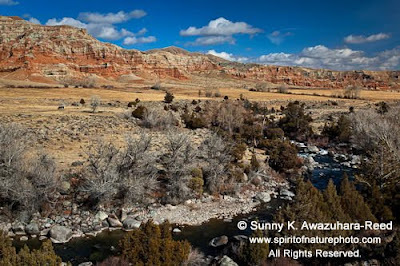 Someday in summer, I’d like to go back there for another sunrise shot with green grass and meandering river foreground. 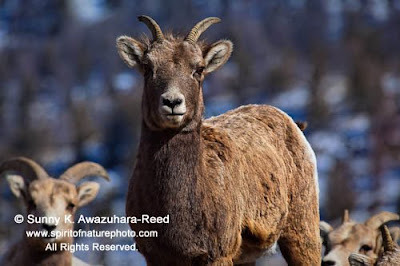 Whisky Mountain in Wind River Range (about 55 miles east of Jackson, outside of Dubois, Wyoming) is famous as a bighorn sheep habitat. Over 1,450 sheep live in the area. 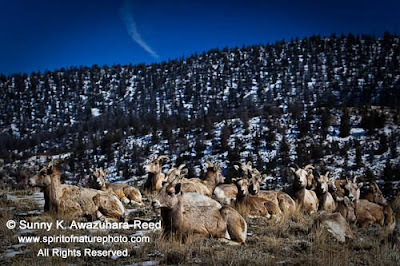 Searching for herd of sheep to photograph one day in March, my friend and I drove over the Continental Divide to Dubois. Although Togwotee Pass and Jackson were in still in the midst of snowy winter, it was already spring in Dubois. Rather than white, the desert valley showed bare brown ground. Flowing water surged through the creeks. 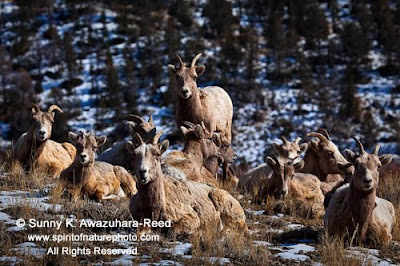 Last time I was in Whisky Mountain Basin, I only spotted two rams on a mountain ridge, way beyond the reach of my telephoto lens. I was so disappointed as there were hundreds of deer all over the place. 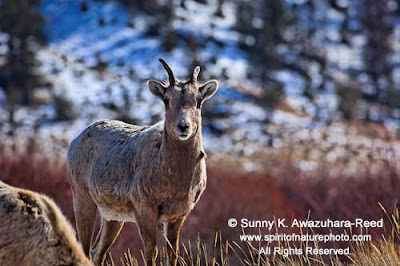 I was eager to capture images of bighorn sheep before I leave this area at the end of March. The weather was nice with streams of bright blue sunshine. After passing the town of Dubois, we drove over the dirt road that leads to Whisky Mountain Basin, adjacent to a meandering creek framed in willows. There was thin layer of fresh snow over the desert ground. I was eagerly searching for a glimpse of sheep on the rocky cliff along the dirt road. I couldn’t spot a single sheep or deer, not even on the farthest mountains. In the warm weather, wildlife moves up higher elevations. So, we decided to hike up Whisky Mountain for a while. A few hours later, we came back to the car and drove all way back on the dirt road. I didn’t even look for sheep anymore. Suddenly, I spotted a group of animals sitting on a large flat rock. Hallelujah, sheep! 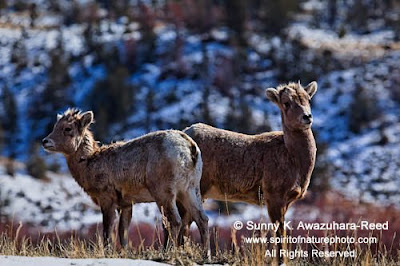 A herd of bighorn sheep were resting and chewing grass only 30 feet from the road! We parked the car, approached, but they didn’t seem to care. 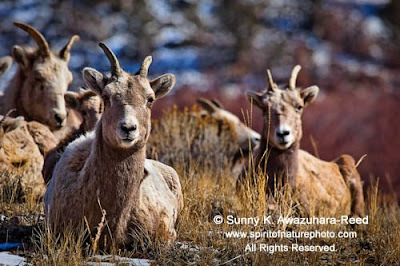 All of them had a pair of small horns on their forehead, but I didn’t see any ram with big curly horns. I slowly open the door and walked out… click went my shutter. Slowly I moved around them to compose more shots. They were still chewing grass in a relaxed manner. After awhile, a few of them cautiously stood up and began walking. Several followed. There were a few lambs in the herd. They found another patch of grass to chew only several feet away from their original place. It was magnificent scene, all those sheep just quietly pursuing their peaceful life.